Your graduate work was on bacterial evolution, but now you're lecturing to 200 freshmen on primate social life. You've taught Kant for twenty years, but now you're team-teaching a new course on "Ethics and the Internet". The personality theorist retired and wasn't replaced, so now you, the neuroscientist, have to teach the "Sexual Identity" course. Everyone in academia knows it and no one likes to admit it: faculty often have to teach courses in areas they don't know very well. The challenges are even greater when students don't share your cultural background, lifestyle, or assumptions about how to behave in a classroom. In this practical and funny book, an experienced teaching consultant offers many creative strategies for dealing with typical problems. How can you prepare most efficiently for a new course in a new area? How do you look credible? And what do you do when you don't have a clue how to answer a question? 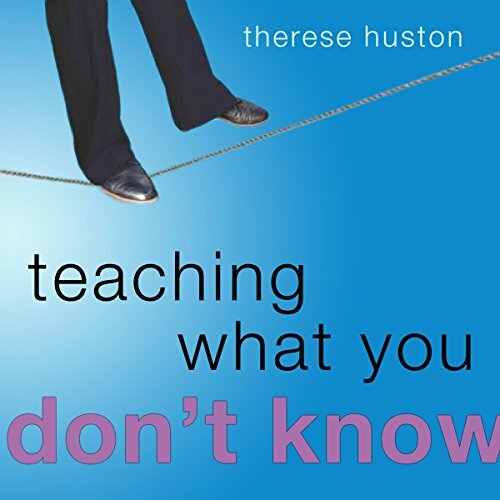 Encouraging faculty to think of themselves as learners rather than as experts, Therese Huston points out that authority in the classroom doesn't come only, or even mostly, from perfect knowledge. She offers tips for introducing new topics in a lively style, for gauging students' understanding, for reaching unresponsive students, for maintaining discussions when they seem to stop dead, and - yes - for dealing with those impossible questions. Original, useful, and hopeful, this book reminds you that teaching what you don't know, to students whom you may not understand, is not just a job. It's an adventure. The book is published by Harvard University Press. Would you consider the audio edition of Teaching What You Don't Know to be better than the print version? I think this book would be better in print. A number of helpful tips and classroom exercises are given that I'd like to access repeatedly. Not as easy when an audible book. What was one of the most memorable moments of Teaching What You Don't Know? The sense that I'm not alone in experiencing feelings of fraudulency and inadequacy as a tertiary educator who is assigned classes outside my area of expertise. Yes. I found the book to be witty and edgy. The narrator was almost robotic and the author's wonderful writing style was not communicated as effectively as it could have been. Highly recommended for any tertiary educator! A lotvof useful examples and advice on improving your teaching, not only limited on teaching outside your competence. The introduction is a bit too long,must survive it,gets interesting when the practical part starts. I joined our faculty 10 years ago and have taught 20 new courses. Great book! Authoress needs to follow own advice. Good useful info. but repetetive and poorly organised. Much of the guidance applies equally to lecturers teaching within their fields. A good edit would turn this into 2 books: A short one dealing with the title and a longer once with best lecture and prep practices. Would you listen to Teaching What You Don't Know again? Why? Yes, very practical and very useful. What about Rebecca Van Volkinburg’s performance did you like? Very good performance. Very apt for the book.